There were no items in the room, save for a picture of a fox on the wall. This was clearly the final destination for an individual suffering from some sort of psychological melee with exactly 26 personalities, with a few of them being similar to each other. I know because this was carved into the door, which was brown in both colour and diameter. I guess this is what happens when your best friend is a green T-Rex who stomps on the same log house every day for years on end and often has private talks with God. Right. I should probably start from the beginning and stuff. You see, one day I was trying to catch a bee. I wanted to remove its stinger and rub the bee between two fingers out of curiosity. However, the bee ate me. Oh yeah, I forgot to mention . . . this bee was as large as a student loan and almost half as dangerous. So anyway, I’m inside this bee. 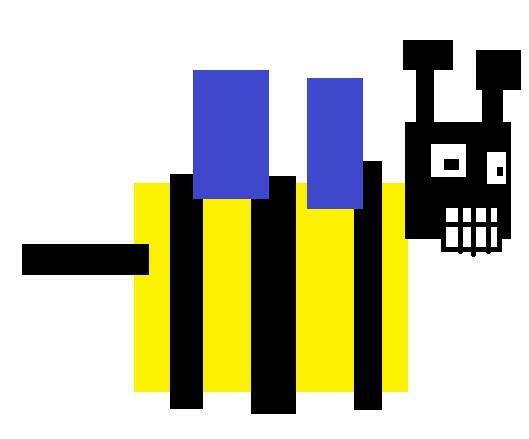 Except this bee is apparently made of furnished condos and billy goats. One of the condos was labelled with the name ‘Billy’. He seemed important, so I took a billy goat and used the billy goat as a billy club on Billy’s door to try and bully Billy into helping me. The door opened and I was greeted by an utahraptor. He beckoned me in and I followed, for I was already eaten once today. He led me to his bedroom with a promise of gingerbread men and classic literature. I was led into the room I mentioned before. He left to grab the latest issue of Popular Mechanics. This is when I got bored and noticed everything I mentioned beforehand. Since I was bored, I left the condo and then left the bee via blood cell surfing after which I went home. The following was drawn by my former roommate and current friend Ansel. Yes, that is the best way I could’ve worded it in my mind. This entry was posted in Bees!, Blog, Blogging and tagged 2012, Art, bee, blogging, pic, picture, short story, story, tales. Bookmark the permalink.